For the third year King Collision turned a wreck into a wonderful gift for a very worthy person. Thursday the company, at 2707 Old Callahan Road, donated a 2016 Nissan Quest to Powell Elementary 4th grade teacher Kimberly Longmire. She’s a mother of two girls, one of which suffers from Downs Syndrome and Cerebral Pasley. Cindy McCoy and Kelly Long of King Collision sat down with The Focus earlier in the week to talk about the special program Volunteer Rides. “When Bill King learned about the program he started the process,” McCoy said. She explained that if a car is damaged in a wreck at 75% of the vehicle’s value it is “totaled.” The totaled car is then rebuilt and gifted to a special person. State Farm donated this year’s car which was taken to King Collision where a total rebuild was begun. “We get parts donated from local businesses and vendors and our employees donate their time during the repairs. Rebuilt cars are perfectly safe and legal to drive,” said McCoy. Volunteer Rides is a local non-profit organization founded by Jeff Mynatt of Byrd Automotive. It coordinates the effort along with AkzoNobel Paints. Other sponsors include Advance Auto Parts, Byrd’s Automotive, D&K Towing, European Import Auto Parts, Federated Auto Parts, Hertz Car Rental, Keystone Automotive, Knox Auto Parts, Michelin Tires, National Tire Wholesale and State Farm Bureau. King Collision’s certified technicians donate their labor and knowledge and those folks include Stan Brock, Daniel Clark, Brandon Calhoun, Juan Diaz, Peter Fonrodona, Charlie Fox, Brandon Horn, Mitchell Irwin, Don Kirchhofter, Josiah Lamb, David Lavender, Kelly Long, Cindy McCoy, Shane Mink, Brandon Moffit, Brandon Olson, Tracy Radford, Bill Ruble and Roger Sikes. Longmire knew she would be getting a car but had not seen the vehicle until it was rolled out with a large ribbon on it at last week’s ceremony. Mynatt opened the presentation by telling the large audience at King Collision’s catered lunch about Volunteer Rides. He said the program has been going on since 2016 at King’s and other repair companies and 14 cars have been donated. He told The Focus that Bill King drove the Nissan for a couple of weeks just to make sure the vehicle was ready for use. Kelly Long invited Longmire to share her story and the teacher, mother of two beautiful girls, and president of the local Downs Syndrome Awareness group told her story. She talked about the birth of Abby, her medical problems before and after birth, the three times her youngest daughter almost passed away, and her family’s support in keeping the child alive. She described the expense and the many trips to Vanderbilt and other places for care and therapy. She said she was told many times that her daughter would not survive. Longmire turned to her family and her faith in God to sustain her daughter and despite the many health issues the little girl lived and is now being taught to walk. 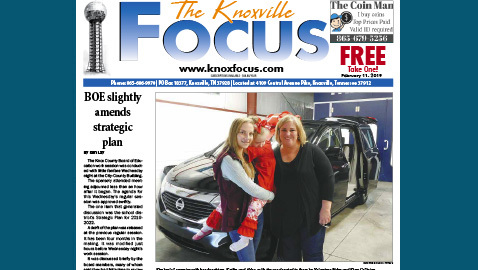 She told The Focus that her former car was not equipped for her daughter and she needed a reliable vehicle for the many trips they must make for Abby’s care. Her older daughter, Katlin, is very helpful with her sister and cradled and cared for her during the ceremonies. “God has put people in our path that we would not have met and given us a testimony to share with others,” she said. “We do lots of therapy and travel lots of places, so this will be a huge blessing,” Longmire said adding what a blessing her mom and dad have been in helping so Longmire can continue to work and have insurance. “God is still showing us a lot,” she told those present.